With the best Plastic surgeons available, you can have this simple surgical procedure to remove excess skin around the eyes. If your vision is impaired by the skin on your upper eyelid sagging down too much, or you just want a more open eyed look, this surgical procedure can provide the answer. If your lower eyebags are too big for our non-surgical tear trough procedure, then our lower blepharoplasty treatment can also be the answer. The skin is simply cut away and the scars are minimal, as they can be very cleverly hidden around your eyes or in the eye hollows. As the skin loses its elasticity, upper and lower eyebags lose their shape. The excess skin, skin folds, fat pads and skin bags give the impression of tiredness and aging. Blepharoplasty, which is a delicate but easy operation, gives back the freshness and the rested look of the face by removing the excess skin and fat pads. After the blepharoplasty surgery, the eyes look bigger and their natural beauty once again shines brightly. The aesthetic operation called blepharoplasty is available abroad, and can be performed even in younger patients. Sometimes inherited lower eyebags with deep tear troughs and big fat pads can be seen. This appearance is even more common in patients who sleep on their front. If those same individuals eat a lot of salty food and drink a lot of water, it is not unusual that they wake up with swollen upper and lower eyelids and bags. The actual skin around the eyes is very thin, and in fact, it is one of the thinnest areas of skin in the entire body. Around the upper and lower eyelids, natural fat pads are situated. These fat pads are the main cause for many changes around the eyes which hence require either a surgical correction, as described here, or even our non-surgical eyebag removal correction. Very individual, and it depends on the indication, but the commonest time for this operation is after the third decade, or with younger patients with large eyebags. Excess skin and large fat pads, dark circles and pigmentations, and wrinkles and folds. Local anaesthetsia is all that is required. 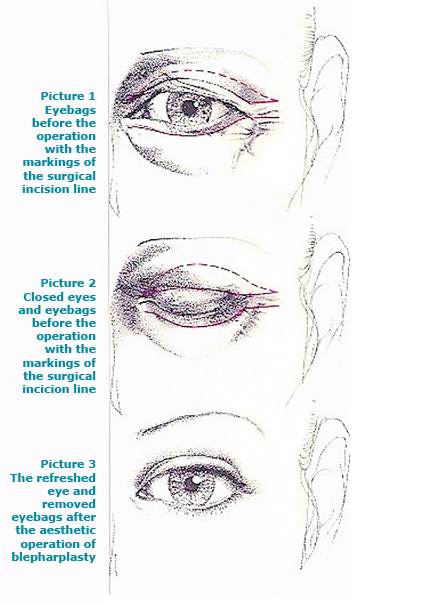 The operation takes about 1 to 1,5 hours; The incision, careful measurement, planning and pre-op drawing are essential. Upper eyebag: the incision is 8-10mm above the edge of the eyelashes – lower eyebag: the incision is up to 5mm below the edge of the eyelashes. The eyes are not covered up. In the first few hours cold packs are applied and after 24 hours warm packs are applied. Antibiotic ointment can be applied around the incision before sleep. After 7 days, camomile warm packs are applied, as well as gentle circular massage, following strict instructions of the nurse. Swelling and bruising start to fade away after 5-7 days. In the first 2-3 weeks, it is possible that a passing asymmetry appears, which in no way should worry the patients, as this recovery. These are completely hidden along the edge of the eyelashes and within the contours of the eye socket, and can not be seen. We can refer you to our partner clinic in Croatia, and the prices are about ¼ of the UK prices, so the price difference is huge. The plastic surgeon performing this procedure in Croatia is brilliant and leaves no scars at all. We offer lower eyelid (blepharoplasty) surgery from our clinic abroad, enquire today for more. This treatment is only available in our Croatia Clinic. Read more about our medical tourism service.